For other uses, see King of Rock and Roll (disambiguation). 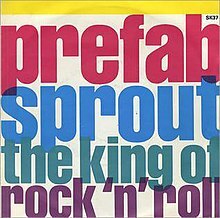 "The King of Rock 'n' Roll" is a single by English pop band Prefab Sprout, released by Kitchenware Records in April 1988. It was the second single taken from their album of that year, From Langley Park to Memphis, and referenced a washed-up 1950s star who is only remembered for his one-hit novelty song, which is sung in the chorus ("Hot dog, jumping frog, Albuquerque”). It remains the band's biggest success in their native UK, reaching No. 7 on the UK Singles Chart, where it spent 10 weeks. Producer Thomas Dolby added a synth bass in the verses to mimic the sound of a bullfrog, tying them to the chorus. (1988) "The King of Rock 'n' Roll"
The single had an unusual music video, featuring the band lying beside a pool and attended by a frog butler, a diver who is reluctant to jump into the pool until the end, and dancing human-size hot dogs. ^ Roberts, David (2006). British Hit Singles & Albums (19th ed.). London: Guinness World Records Limited. p. 433. ISBN 1-904994-10-5. ^ "The King of Rock 'N' Roll - Prefab Sprout - Song Info - AllMusic". AllMusic. Retrieved 23 November 2018.